Stratosphere Las Vegas is a casino hotel and also the tallest observation tower, and the 5th-tallest structure, in the United States, as well as being the tallest structure in Las Vegas. It is owned by Whitehall Street Real Estate Funds, an affiliate of Goldman, Sachs & Co who purchased American Casino & Entertainment Properties which includes the Stratosphere along with three other properties. The sale closed on February 21, 2008 for US$1.3 billion. The property’s signature attraction is the 1,149 ft (350.2 m) Stratosphere Tower, the tallest freestanding observation tower in the United States, and the second tallest in the Western Hemisphere, surpassed only by the CN Tower in Toronto, Ontario. The hotel is a separate building with 24 stories, 2,427 rooms and an 80,000 sq ft (7,400 m²) casino. The Stratosphere is the northernmost of the major Strip casinos and the only one actually in the City of Las Vegas, as the rest of the Strip south of Sahara Avenue is in the unincorporated townships of Paradise and Winchester. Casino: Yes, 80,000 square feet. The casino has more than 50 table games like Blackjack, Roulette, Fortune Pai Gow Poker, Mini-Baccarat, Three Card Poker, Let It Ride Poker, and 10x odds on both Craps and Crapless Craps, and more than 1,200 slots and video poker machines. There is a poker room. Race & Sports Book: Yes, a 120-seat race and sports book, equipped with 33 televisions and 24 big screens. Restaurants: The Stratosphere has the following dining options: Top of the World, The Buffet, Roxy’s Diner, Fellini’s Ristorante Italiano, McDonald’s, Wetzel’s Pretzels, El Nopal Mexican Grill, Tower Pizzeria, Ben and Jerry’s, Back Alley Bar and Starbucks. Entertainment: Entertainment includes: Bite and lounge acts. The Back Alley Bar has live music every Thursday through Sunday. Nightlife: Yes, The Back Alley Bar, C Bar, Airbar, Level 107 and Images Dueling Pianos. 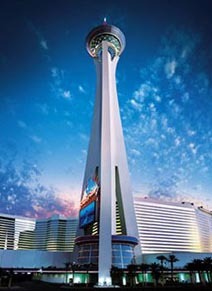 Attractions: Yes, Big Shot thrill ride, SkyJump Las Vegas, Insanity-The Ride, X Scream and the Stratosphere Tower itself. Pool: Yes, one 15,000-square foot pool, oversized Jacuzzi, waterfall, cabanas, special events area with panoramic views of Las Vegas. Health Club or Fitness Equipment: Yes, there is a fitness center. Spa: Yes, Roni Josef Salon and Day Spa offers multiple types of massages and services. The spa also has a full-service salon. Shops: Tower Shops at the Stratosphere featuring nearly 50 shops and 15 retail carts. Wedding Services: Yes, the Chapel in the Clouds offers a number of wedding ceremony packages. Convention Rooms: Yes, more than 8,100 square feet of meeting space. In-Room Internet Access: Internet Wi-Fi service is available in your hotel room for a fee. Hotel Amenities: Concierge, currency exchange, luggage and maid service, safety deposit boxes, wake-up calls. Parking Garage: Yes, an eight-story parking garage, but only seven are operable. Standard Room Amenities: Desk, electronic door locks, radio, telephone, air conditioning, alarm clock, 42-inch flat-screen TV, hair dryer and pay-per-view movies. Policies: Children 10 and under stay free with an adult. The maximum total number of guests (adults and children) in a room is four. Incidental Charges: The Stratosphere charges a $7.50 per room, per night resort fee for a maximum of five nights. The fee includes 2-for-1 “Bite” show tickets, admission to the tower during regular operating hours and pool access. The hotel requires a credit card or a cash deposit for incidental charges. The resort fee listed above does not include tax. Some resorts also apply room tax to their resort fee.